See the Golden Gate Bridge—From Below! We start from Horseshoe Cove. 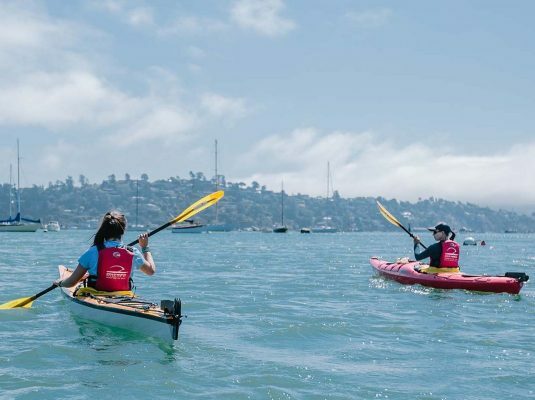 Because this trip can deal with some strong currents flowing through the bay, we give you a thorough orientation to build your confidence and ensure you can take care of yourself in a kayak. 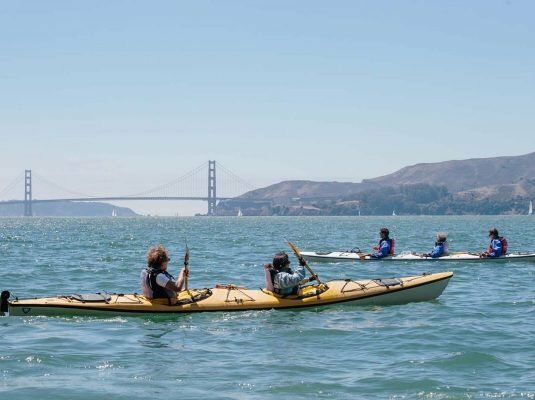 If you have passed our Angel Island Class, you can choose to paddle in a single kayak. Everyone else must use a 2-person kayak. 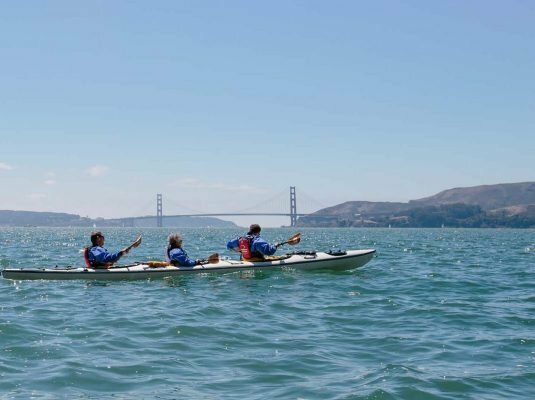 We paddle down the coast, taking care to stay close to shore, and away from shipping lanes. 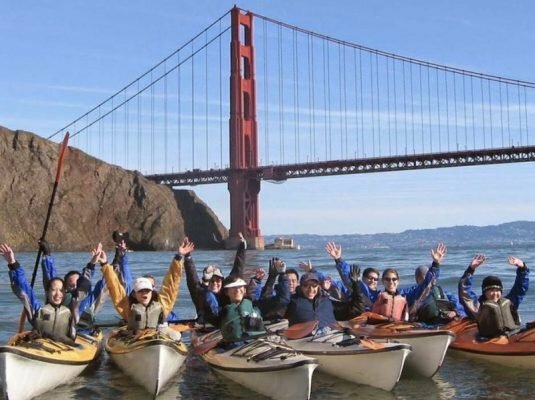 We travel beneath the Golden Gate Bridge and along the Marin Headlands before returning to Horseshoe Cove. This trip takes about 3 hours, and does not require any experience kayaking. We leave in the morning, though the exact time will depend on the tides that day. Check available dates through our website, or call (415) 332-8494 for a reservation. If you’re coming from SF and South: Take the first exit (Alexander Exit) after crossing the Golden Gate Bridge. Proceed downhill for about 50-100 yards and take a left following the sign Fort Baker & Bay Area Discovery Museum. If you’re coming from the North: Take the last exit, Sausalito Exit just before the Golden Gate Bridge. Bear right following the Sausalito and Bay Area Discovery Museum signs. Drive under the freeway to the stop sign. Continue downhill. Take your first left at the Fort Baker & Bay Area Discovery Museum sign. 100 yards later take a right following the 2nd Fort Baker & Bay Area Discovery Museum sign. (Note: do not enter the Ft. Cronkite Tunnel.) Continue downhill to stop sign. Go right following Bay Area Discovery sign. At the next stop sign go left on Center Road/East Road towards Bay Area Discovery Museum. Look for New Breitung Road and take a right to the end and continue past Battery Yates sign. Road will drop down onto Marina Road and look for the Sea Trek truck (white Ford F-150) and trailer and/or Sea Trek staff and kayaks on the beach below. (You will now be on the east side of Horseshoe Bay near the sailboats just in front of the big Presidio Yacht Club building). Mileage from freeway: approx. 1.6 miles. Follow Bridgeway south out of town. Brideway turns into Second Street (pass the Golden Gate Market) and then Second Street turns into Alexander Avenue. Follow Alexander Avenue uphill for a short while then take a right at the Fort Baker sign and onto East Road. Follow this road for approximately one mile and you’ll come to the Bay Area Discovery Museum. Look for New Breitung Road and take a left to the end and continue past Battery Yates sign. Road will drop down onto Marina Road and look for the Sea Trek truck (white Ford F-150) and trailer and/or Sea Trek staff and kayaks on the beach below. (You will now be on the east side of Horseshoe Bay near the sailboats just in front of the big Presidio Yacht Club/ Travis Marina building).